Does marketing have to be generic, anonymous and ‘ball-park’? No, says Pete Winter, Performance Consultant at Tomorrow People. Read his introduction to a method of online marketing that uses intelligence and data to woo and win leads and customers. 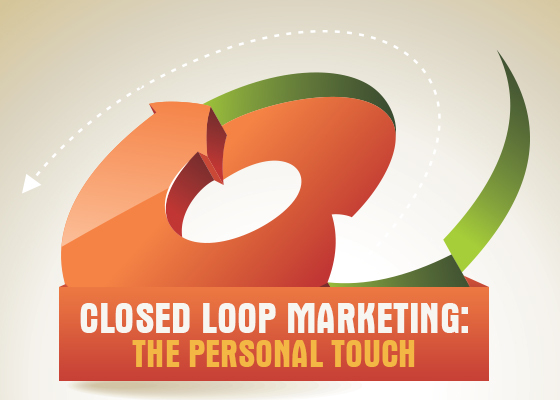 The biggest single factor for successful closed loop marketing is data. The more data we have about a visitor’s behaviour the more personalised we can get with them and ultimately provide the right offer at the right time to the right person to achieve a sale. Think about it for a second. How many times have you been searching online for something, moved to another site and seen an advertisement for the product or service you’ve just been searching for? My guess is a lot, and from personal experience it’s a pretty safe bet to say that the majority of people who are reading this will say the same.This is a tactic known as readvertising. Many companies utilise a marketing automation system to manage a closed loop marketing campaign. These systems allow marketers to automate triggered responses, personalising the content to each individual without the need for manual segmentation to ensure the closed loop campaign is successful. A visitor arrives at a site and a cookie records the source of entry to the site (for example via a particular search term, or from an e-mail campaign). We will now be able to track the user all the way back to their original entry point. Now that we are tracking the user, we are able to see how they interact with our site, which pages they view, the flow of their journey and so on. This information can help us to present relevant offerings to a visitor further down the road, helping to reduce the amount of time it takes to go from customer to lead. This is probably the trickiest part of the whole process, as we then have to connect the visitor’s data with their lead information once they have converted into a lead or a customer. Again, fortunately, there are several offerings in place which enable this to be done automatically. HubSpot, for instance, provides a great tool which allows you to implement closed loop reporting. Behavioural information collected, the next stage is to get opt-in contact details. This is a key part of converting the visitor into a lead or, even better, a customer. For most this involves filling out a form of some kind, either to complete a transaction, to download a piece of content or to be kept informed of future information. Now, armed with the information we have collected, we can see exactly what drove the visitor to the site, how they interacted when they arrived and their voluntarily-given details which, if applicable, can be passed onto the sales team as a qualified lead opportunity. So now we have all this information, what do we do with it? Well for a start, we can present the visitor with a more personalised experience upon their return to the site. Advertisements can be tailored around their browsing or purchase history, e-mail campaigns can talk to them directly rather than being generic… the potential is enormous. All of this, each stage of the process, how we work going forwards, how we present an offering to a visitor all comes back to the same factor. Without data we are blind; with data we have potential. By using data correctly, not only is the sky the limit, but we are also able to close the loop and seal the deal.